With no signs that he’ll ever be seen in an NFL uniform again, Colin Kaepernick is apparently getting into the merchandise game. On Monday, TMZ reported that the former San Francisco 49ers QB had filed a trademark for his “I’m With Kap” slogan to use on that merchandise. 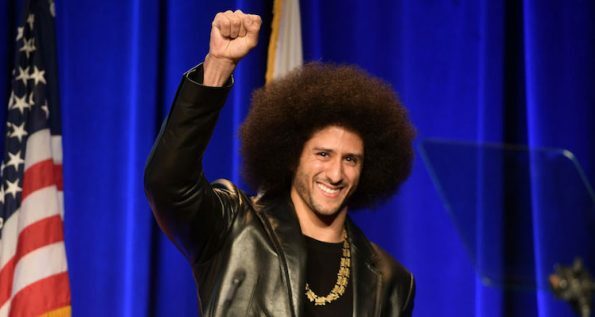 Over the past two years, the slogan has become a calling card as he continued to go unsigned by NFL teams following his decision to kneel during the playing of the National Anthem during the 2016 season. “Now we’ve learned Kap has filed paperwork in California to own he slogan for use on shirts, hoodies, caps and other apparel. This could be a huge money move for Kaepernick with NFL checks no longer coming in. It certainly isn’t a desperate move since he made more than $40 million in contract money during his career. As of right now, Kaepernick still has a lawsuit against the league that claims owners are colluding to keep him out of the NFL because he kicked off the protests that continue to be a huge story as we head into the 2018 season.